A few weeks ago it was our pleasure for our diocese to host the national convention of the Catholic Daughters of the Americas. Over 1,200 dedicated Catholic women from all over the country attended. The theme for the convention was ‘Serve the Lord with Gladness.’ I was privileged to pray the Welcoming Mass. Below is an edited version of my homily on that wonderful occasion. 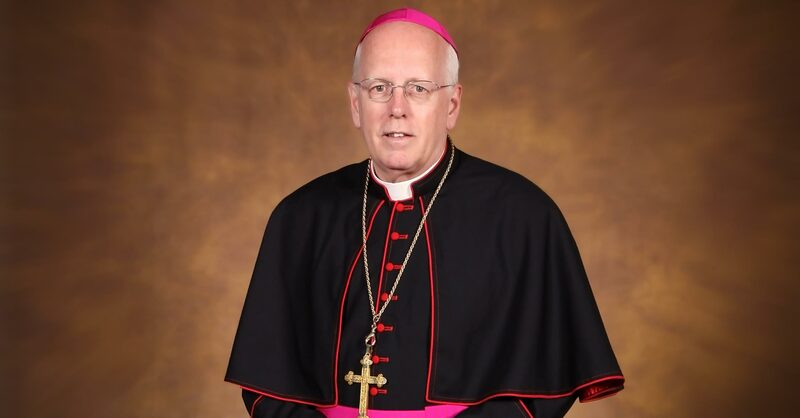 It is my pleasure to welcome you to South Dakota and the Diocese of Sioux Falls. I pray that your stay with us is one of joy, spiritual enrichment and fun. The beauty of the falls, the enormity of the wide open spaces, the legacy of Native Americans and immigrants who built and sustained South Dakota and the Church over the years is inspiring. It is a testimony to faith lived well, tenacity in providing for family and parish, and perseverance through the natural and man-made challenges over the years. South Dakota is testimony to the truth of our psalm response this morning: The Lord will not abandon his people. Allow me to introduce myself. I am Bishop Paul Swain. I am an adult convert to the Church, having been received into the Church at age 39 after practicing as a lawyer including as legal counsel to a governor of Wisconsin. I continue to do penance for that time in my life. I was an intelligence officer in the Air Force and am a Vietnam War veteran, which experience changed my life. I was ordained a priest for the Diocese of Madison in Wisconsin at 44. Certainly I never imagined that I would be named a bishop with my sketchy background. I tell you this to assure you that our Lord never abandons his wandering sheep. I had never been to South Dakota until I was named bishop 12 years ago. It is now my home both physically but also in my heart, so strong is the prairie spirit. I should note that a rating came out only last week identifying South Dakota is the best state for retirement. All of you are welcome to stay here. The church in South Dakota began with the missionary Martin Marty, a Benedictine priest who came here from Switzerland by way of St. Meinrad Abbey in Indiana to bring the Good News of Jesus Christ to the Lakota Sioux in the 1850s. He became the territorial bishop of the Dakotas and with the admission of the states of North and South Dakota into the union in 1889 he became its first bishop. Our diocese compared to many from which you come may seem recent, only 129 years in existence and small in population with some 125,000 Catholics. It is however large in geography, 35,000 square miles, so I spend much time in the car. I am so grateful to the Catholic Daughters of the Americas in our state and diocese who contribute in so many beautiful ways in parishes, in outreach ministries, and especially in witness of faith in a world that is so in need of the unity and charity which is the mission of Catholic Daughters. The gospel reading reminds us is that no one knows the Father except through Christ. Your lived commitment to Christ can foster that unity and charity so needed in our day. The Catholic Daughters in our state have now witnessed this faith for 100 years. My episcopal motto is “Give Praise to the Lord”. On behalf of the Catholic faithful in both the Dioceses of Sioux Falls and Rapid City and all who benefit from the works of justice and mercy that the Catholic Daughters have offered for a century I do Give Praise to the Lord. First, let us individually and humbly more deeply recognize God’s love, ponder his word with openness of heart and allow Him to draw us more closely to Himself. Second, let us deepen our personal relationship with Jesus Christ and become more joyful disciples every day of the week even on the tough days. We will be able to do so if we deepen our prayer life. We can be like the little boy who was asked by his grandmother, “Did you say bedtime prayers?” “Yes, grandma.” “Did you say your morning prayers?” “No, grandma.” “Why not?” “Well, I’m not afraid in the daylight.” Morning inevitably turns to night but morning does come again. Saint Mother Theresa once recommended that we pray by imagining that Jesus is staring right at us. Just the thought of it is a little unnerving, Jesus staring at me. She wrote: “Have you seen with the eyes of your soul how he looks at you? Not only does he love you, but he longs for you.” If we are honest with ourselves we long for God: our souls are restless until they rest in thee, St. Augustine reminded us. Make the most of today’s opportunity to feel his love through prayer. Third, let us reaffirm the truth that God is the creator of life at conception and the protector of life until natural death. Therefore respect for the life and dignity of all persons as children of God, those unborn who are more than body parts, the frail elderly who deserve honor not disposal, those who suffer in so many ways who deserve care not casual isolation or elimination, and those immigrants, refugees, the poor and needy whatever their age or position who deserve to be recognized as children of God, our brothers and sisters. Fifth, let us become people of reconciliation and forgiveness to others, rejecting agendiized categorization of others into impersonal groups and especially forgiving those closest to us and to seek God’s forgiveness for ourselves. Sixth, let us courageously defend religious liberty and freedom of conscience in whatever forum is necessary. Religious freedom is not an act of government; it is a gift from God written in our hearts. And finally let us ask the Blessed Mother, model of Christian discipleship and fidelity, to pray for and guide us. She always leads us to her Son. When we sacramentalize the routines of our day, referencing all we do to God, we can cope with the realities of our day with hope. Our hope is in Jesus Christ who is the same yesterday, today and forever. With the same faith, tenacity and perseverance of those who built and have sustained the Church on the prairie, wherever we live, we can serve the Lord with gladness every day simply by how we live, serve and love one another in Christ. May God continue to bless you in your mission to bring unity and charity and may St. Joseph the patron of our diocese watch over you and those you love.